After a decade of strong returns, global stock markets threw a wrench into the works in 2018. As we discussed in our annual market commentary a few weeks ago, the market decline was relatively small from a historical perspective. Nonetheless, judging from the current media coverage, it sometimes seems as if capitalism itself is coming to an end. There certainly seem to be many risks on the horizon. We are going through major political uncertainties, including a government shutdown, continued tariff wars, a probable Brexit later this spring, and rising tensions among the world’s leading powers. But it is important to remember that there are always risks on the horizon. There always have been and there always will be. Those uncertainties are the very reason stocks earn better returns than cash in the long-run, so we should be careful about wishing them away. One of our advisors rightfully states that ‘if you wish risk away, you wish your returns away.’ Since market swings are often unsettling and it sometimes feels that ‘this time is different’, we decided to rewind back to the end of 2016. Let us revisit the sentiment back then, review what ‘experts’ predicted, and evaluate the subsequent performance. What was the sentiment two years ago? As can be seen from the sentiment above, as we entered 2017, the world seemed full of uncertainty – not too different from how it feels today. However, fast forward to the end of 2018 and over this 2 year-period, global stocks returned 11.5%, U.S. taxable bonds returned 3.5%, and muni bonds returned 6.8%. While these returns may be less than we would expect over a 2-year period (largely because of the poor returns in 2018), they are positive nonetheless, and far better than if an investor had parked money in cash. 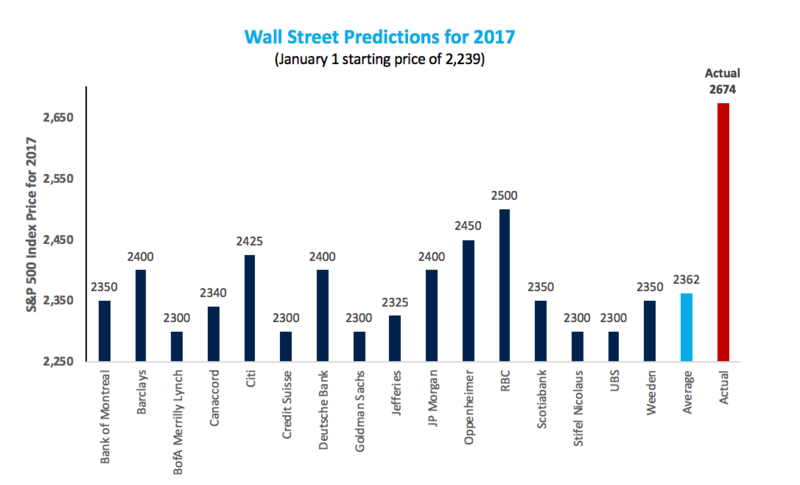 How accurate were Wall Street’s crystal balls? The experts guessed poorly for 2018 as well. This time they were far too optimistic. While the average guess of 2,964 implied a positive price return of 11% for 2018, the index dropped more than 6% and ended the year with an index price of 2,507**. This is not an attempt to name-and-shame the top investment firms on Wall Street. In fact, our lack of belief in forecasts, predictions, and outlooks is not a judgment on the market professionals providing these forecasts. The economists and strategists at these top investment firms are some of the brightest, most educated, and highly experienced professionals in the field of finance. But their insights, the insights of other professionals, and a volume of other information, is already reflected in market prices. 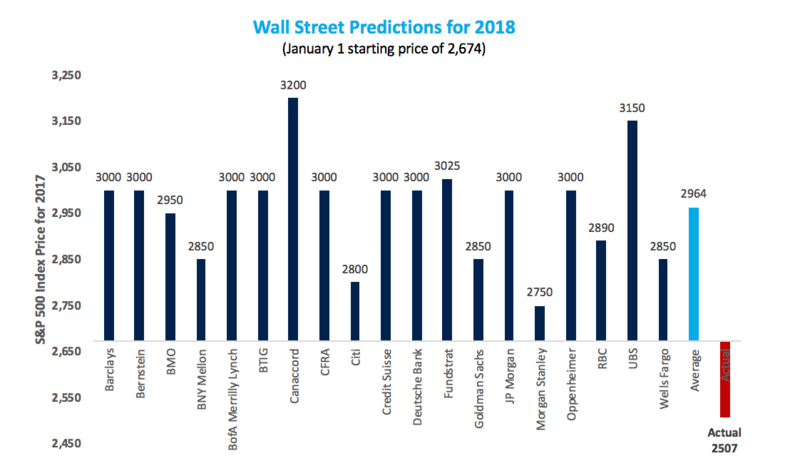 Given this reality, market predictions typically fail to materialize. There’s a famous saying that ‘He who lives by the crystal ball soon learns to eat ground glass‘. Because predicting market movements does not work, your portfolio here at Private Ocean is constructed for the long-run. We seek to capture market returns, rather than hurting your portfolio by trying to outguess the market. As humans, we are all wired to avoid risks, and this part of our DNA has kept us alive since the stone age. However, these instincts can hurt us when it comes to investing in the markets. Our instincts can lead us to make emotion-driven decisions often leading to buy-high-and-sell-low activities. Taking a long-term approach helps mitigate that. While our current times may seem uncertain, it is important to not fall prey to the folly of forecasts without predictive power. Risk and uncertainty are felt short-term, while returns are earned in the long-run. The key to market success is to ignore the daily noise and focus on your financial goals. As always, feel welcome to contact your advisor if you have any questions or concerns.